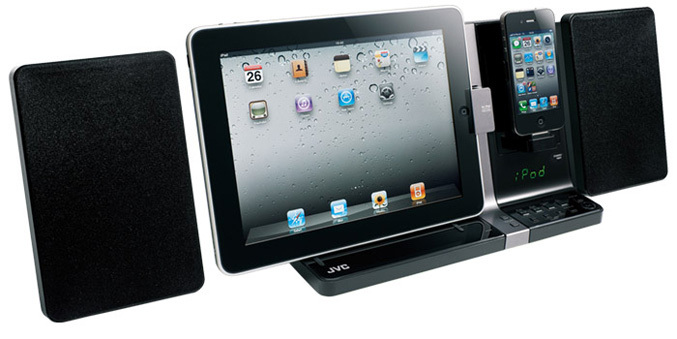 JVC intros a new dual dock which allows you to hook up your iPad and iPhone simultaneously. 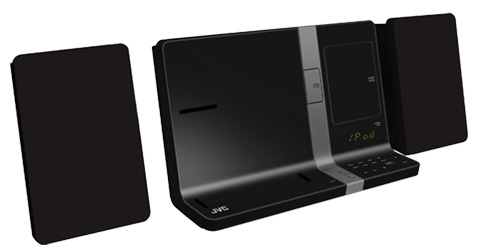 The new JVC UX-VJ3 dock comes with a pair of separate speakers, an AM/FM tuner, a clock, sleep timer and alarm, and offers 30 watts power (15W + 15W). This dual dock features a simple design with slightly angled vertical slab that blends into a full-width LED illuminated base where the system’s controls are located. It also can handle your iPod and packs a subwoofer output, an Aux Audio Input for connecting other devices, mini-USB Input and a video output. It has integrated four sound modes (rock/pop/classical/jazz), plus a surround sound mode, and Sound Turbo function that provides a bass boost. The JVC UX-VJ3 will be available in the U.S. in black and white variants next week, paired with a remote control for $199.95.